GLEE CLUB SMARTIES™ — now on iTunes! GLEE CLUB SMARTIES™ by yours truly is available for a limited time on iTunes! The complete audio is also available on archive.org and blogger. Happy listening! From the musical Glee Club Smarties™ comes Waiting for Santa. The Christmas Eve anticipation is described with a light-hearted, magical sense of wonder by Jeffrey Eric Funk in this new original song. Young singers will not only relate to the lyrics, but will enjoy singing this delightful tune, which is a throwback to the ’50s sock-hop era. Don’t wait for this one…get it now! This edition includes engraved melody-oriented sheet music with real page numbers for Two-Part & Three-Part Mixed voices with piano accompaniment. Leaving toys for girls and boys, heigh-ho! From the musical Glee Club Smarties™ comes One Smile. What does it take to put a smile on your face? Jeffrey Eric Funk has answered the question with this delightful, fun original. The answer, of course, is One Smile! It’s a tune that’s great to open every rehearsal. Bring the house down with a stage full of smiles on your next concert! Don’t let the year go by without performing this one! This edition includes engraved melody-oriented sheet music with real page numbers for Two-Part & Three-Part Mixed voices with piano accompaniment. One more smile on one more face. Shining face like no other. Just one frown can get you down. Smile at people you meet. Make one more smile on one more face. When you start your day with just one smile. When you’re lost in thought or feeling blue. With close friends; you’ll feel better. Never know, it might catch on. Spreading joy ‘cross the nation. 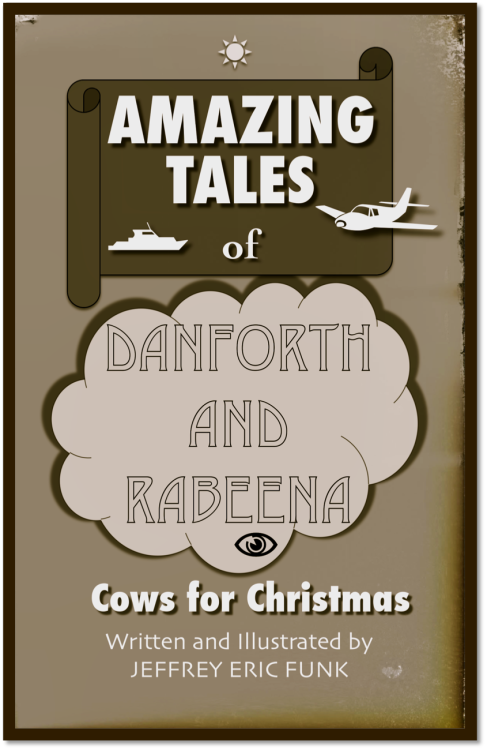 AMAZING TALES OF DANFORTH AND RABEENA: Cows for Christmas by JEFFREY ERIC FUNK. Things are quite strange over at Danforth & Rabeena’s house. This Christmas, they’re dealing with cows and leprechauns. Not to worry though; Olivia the maid is fully prepared for her “cow poop cleaning duties.” Get your copy of Amazing Tales of Danforth and Rabeena: Cows for Christmas today! On Christmas Eve, Oliva the Maid must clean windows, dodge leprechauns and rescue the family cat while everybody in the house watches from the family room by the fireplace. With the help of Grayson the Butler, Danforth contends with a gang of escaped cows whose misconduct is accounted for with lots of nasty details. And Santa Claus makes a memorable entrance in this unusual story of adventure and Christmas wonder. From the musical Glee Club Smarties™ comes an upbeat song for young singers. Earthlings celebrates all creatures—”all sizes, shapes and colors, young and old together, filling the world with love.” This light-hearted rock original from Jeffrey Eric Funk brings a great message of love among all people. Fun for all! This edition includes engraved melody-oriented sheet music with real page numbers of the octavo for Two-Part voices with piano accompaniment. I can see all kinds of creatures. Notice all their special features. Filling the world with love. We can sing in perfect harmony. Spreading love around this planet.